A recent article "365 days of everything: daily creative projects" published in the on-line newspaper AnnArbor.com highlighted blogs that are focusing on doing something every day of the year, i.e. all 365 days. I appreciated having this blog included! Even though I don't post everyday (far from it), the goal of my blog is to provide information and inspiration for myself and my readers to eat some kale or any of its many delicious Brassica relatives every day of the year. Never fear. There is no need to eat that full grocery-bag of kale that you just picked up at your local farmers' market in one sitting, although it is surprising how that much kale could easily be reduced to a large bowl of kale chips and also how quickly those chips could be consumed. Choose a variety of my recipes to try over the next week or so, even including freezing some of the kale if you really are the lucky recipient of a windfall per se! One reader recently asked for my favorite kale recipe. Oh dear, that would be like choosing a favorite among your children! Simply impossible. :-) However, here are 5 that I make over and over again, in no particular order. My husband and I have been traveling for the past week, and I found that I really missed eating kale and other Brassica vegetables on a daily basis. The first thing I did after getting home last night was to make a big salad from local hoop-house spinach and radishes along with some cabbage and a bit of salad greens. No kale, but both cabbage and radishes are Brassicas and so are an acceptable stand-in for kale. Wow, did that taste good. After politely asking my husband if he wanted a second helping, I eagerly finished it up. I send best wishes for a happy and healthy 2011, filled with kale and other delicious Brassica vegetables and whatever you enjoy doing each of the 365 days of the coming year! I am glad I found your site. You may already know this but raw kale is a top superfood. It is the most nutrient dense food available according to Dr. Joel Fuhrman's ANDI rating. Keep up the great work! Happy and Healthy New Year! I have just been diagnosed with breast cancer. Is Kale better for you if cooked or raw? I eat kale and other Brassica vegetables both raw and cooked. However, I always cook them for less time than most recipes suggest and also save any cooking liquid in my freezer to add to future soup stock. I expect I am getting the best of both that way. 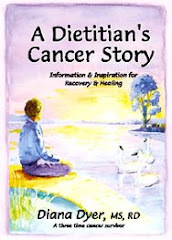 My website www.CancerRD.com and book may also provide helpful information. I send all my best wishes for health, healing, and hope! I co-write a food blog and we are currently hosting a kale themed week. I was cruising around checking out other kale related blogs and stumbled across yours. By far the most kale infused blog I have seen to date. Very impressive! Love kale. Thanks for sharing. Was just writing a post about kale on my own blog and came across yours while researching some kale info. I love kale, especially during the English winter when there is very little of nutritional value in season. My mum is a cancer survivor and she too now eats loads of it. Great site, and I'll point her in the direction of your recipes. Since you were featured in ann arbor.com, does that mean you currently live in Ann Arbor? If so, do you grow your own kale, buy from local farmers or buy it someplace else? Yes I live in A2 and buy my kale at the People's Food Co-op and the year-round farmers' market at Kerrytown on Saturday's. I also froze some. Two other places to check are the Ypsi Food Co-op and the St. Joe's Farmers' Market in the hospital lobby on Wednesdays between 11-1 and 3-5.